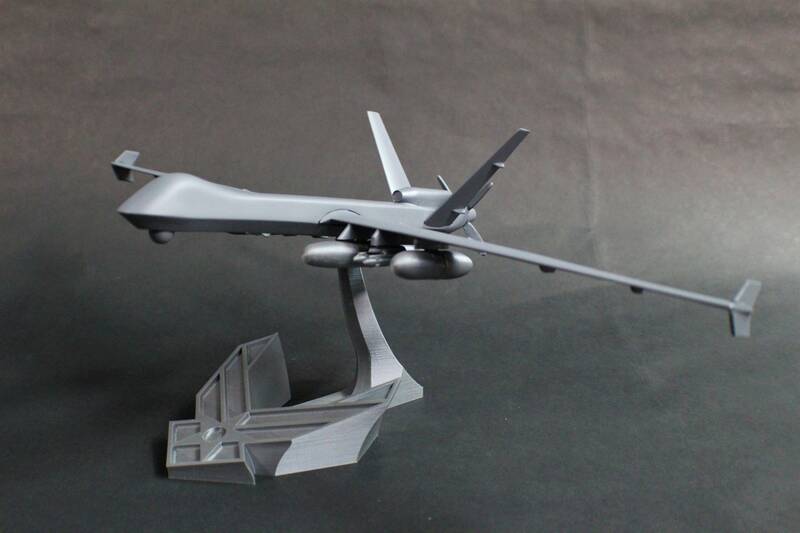 This is a model I designed for display inspired by the Reaper MQ-9 Unmanned Aerial Vehicle (RPA, drone, UAV, etc.). 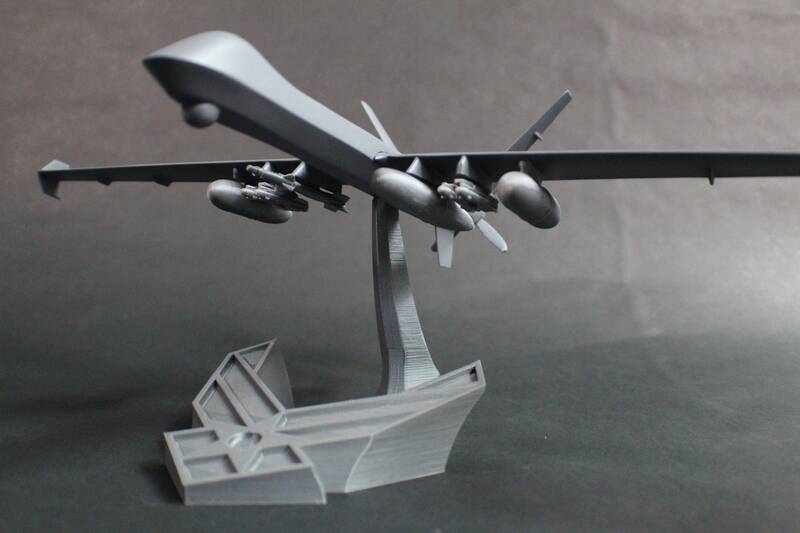 It has a 18 inch wingspan and is 7 inches tall when sitting on it's stand. 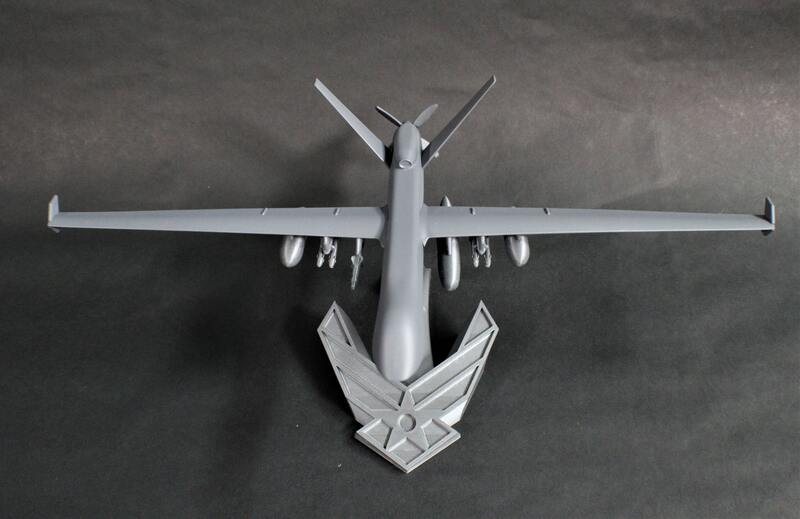 The wings and stores are detachable, as is the UAV itself from the stand, to make for easier shipping and transport. This is cast in the highest quality urethane resin with no fillers, and then hand-fitted and sanded in 4 grades for a smooth finish. 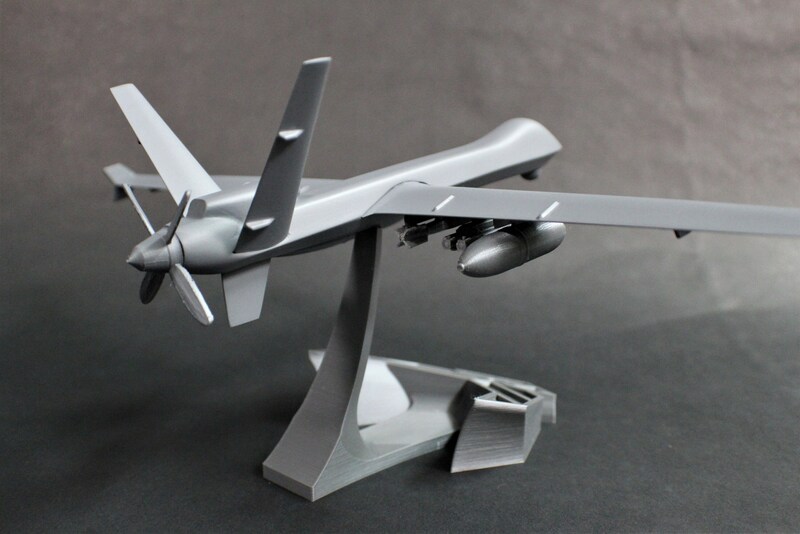 I then paint each model to duplicate the color and sheen to match the real MQ-9. The stores are 3D printed. 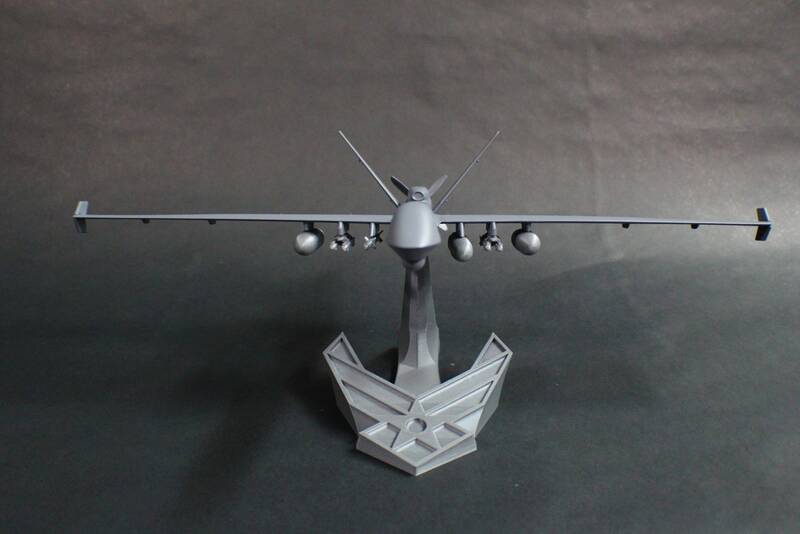 The molds are actually quite expensive to make, and I get a limited number of MQ-9s from each set. 3DPD is the official supplier to the GA-ASI Employee Recreation Association (ERA) Store. If you are a General Atomics Employee, check the ERA store site to receive a special coupon code for a discount before you check out! "The General Atomics MQ-9 Reaper (formerly named Predator B) is an unmanned aerial vehicle (UAV) capable of remote controlled or autonomous flight operations, developed by General Atomics Aeronautical Systems (GA-ASI) primarily for the United States Air Force (USAF). The MQ-9 and other UAVs are referred to as Remotely Piloted Vehicles/Aircraft (RPV/RPA) by the USAF to indicate their human ground controllers. 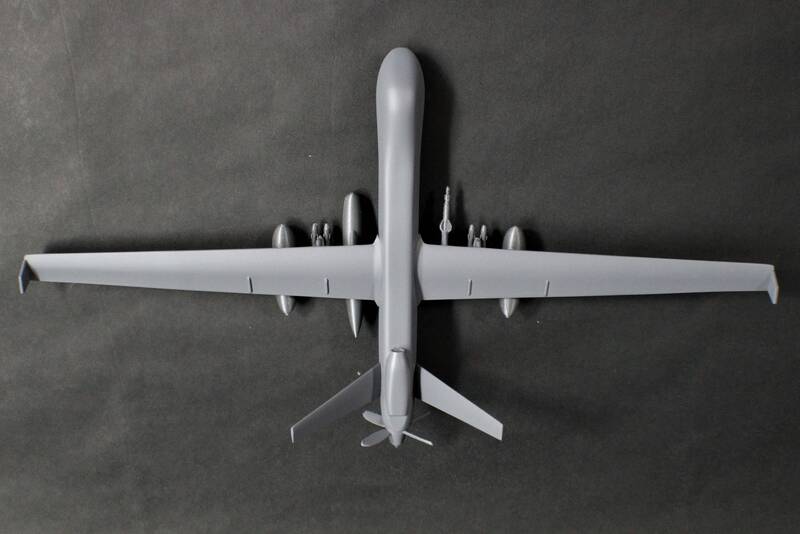 The MQ-9 is the first hunter-killer UAV designed for long-endurance, high-altitude surveillance. 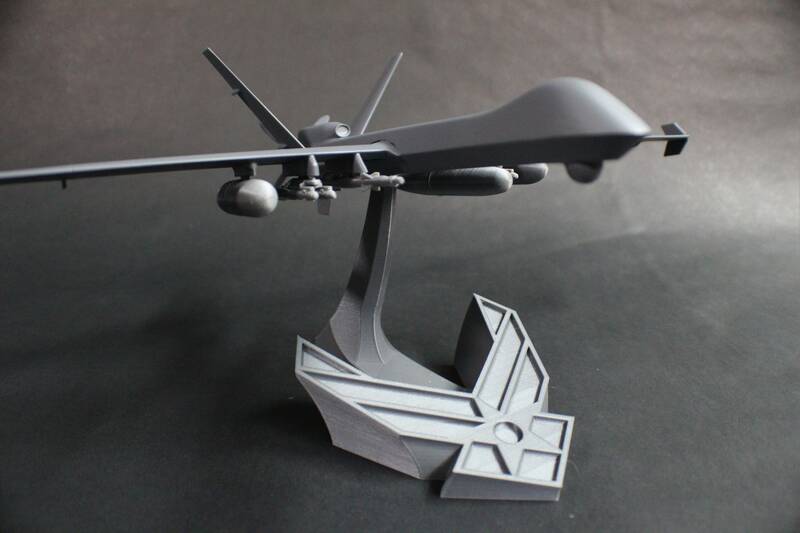 In 2006, the then–Chief of Staff of the United States Air Force General T. Michael Moseley said: "We've moved from using UAVs primarily in intelligence, surveillance, and reconnaissance roles before Operation Iraqi Freedom, to a true hunter-killer role with the Reaper." The MQ-9 is a larger, heavier, and more capable aircraft than the earlier General Atomics MQ-1 Predator; it can be controlled by the same ground systems used to control MQ-1s. 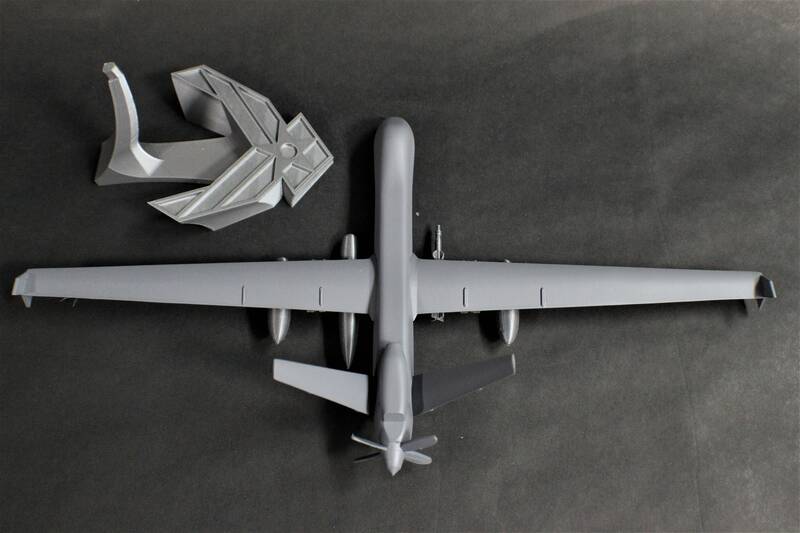 The Reaper has a 950-shaft-horsepower (712 kW) turboprop engine (compared to the Predator's 115 hp (86 kW) piston engine). 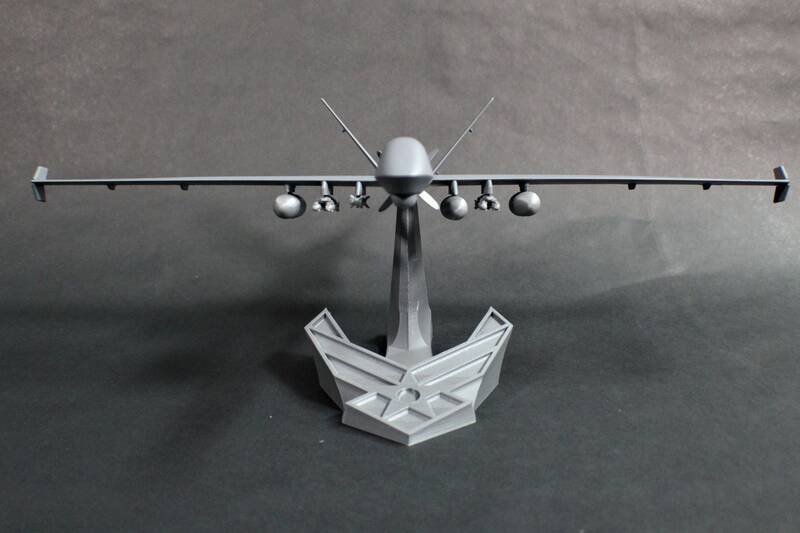 The greater power allows the Reaper to carry 15 times more ordnance payload and cruise at about three times the speed of the MQ-1. The aircraft is monitored and controlled by aircrew in the Ground Control Station (GCS), including weapons employment. 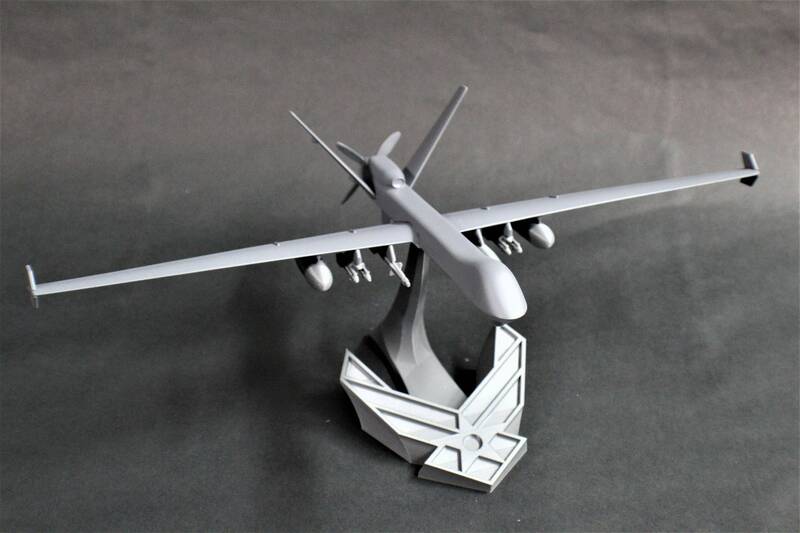 This specific model is cast in high quality resin, hand fitted and assembled, then hand-sanded, and finally painted. These take me a while to make, so I'll need a week to turn it out. This is a hand-made product, so there may be minor defects (rough edges, bumps, etc). As a result, every model will be a unique creation with a character all of it's own. Derek continues to make a great product and we will definitely be doing business with him again!